Sing Bingo Mobile | Get Your 120 Bingo Tickets Offer! Sing Bingo is an established, safe and well-respected bingo site that has recently taken the mobile bingo world by storm, offering all new players free games access with no deposit required, plus a lucrative 120 free bingo tickets when you add just £10. Getting started with the mobile app couldn’t be easier, simply head over to the site through one of the links on this page, create an account and start playing no deposit bingo today. The Sing Bingo mobile app can be downloaded without having to go to an app store or anything like that. The site is sophisticated enough to detect what type of device you are using, so if you visit through your laptop, tablet or smartphone, you will automatically get the right app for you. 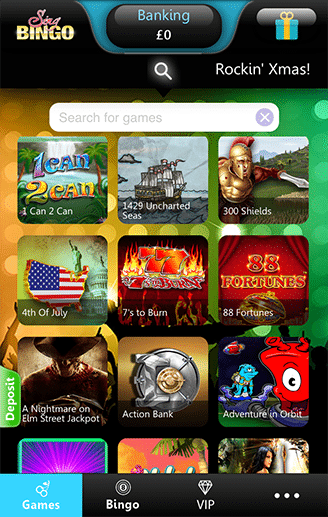 The app itself uses industry leading Dragonfish software, the same software which is used on other popular sites like Costa Bingo and Rewind Bingo. 120 free bingo cards on your first £10 deposit. 60 free cards on your second deposit and 30 free tickets on your third. Free bingo games, 24 hours a day, win real money! Win free prizes with the Jukebox Jumble every day for seven days when you top up £5 or more. Guaranteed jackpot prizes of up to £3000 to be won. Win up to £5,000 with free tickets to the Friday Fest every week. At Sing Bingo you will find a plentiful supply of both 75 ball and 90 ball bingo games. Plus with tickets starting from 1p each, you don’t have to be a millionaire to play! 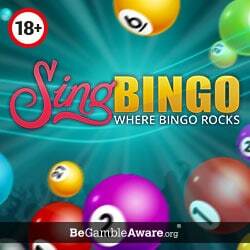 One area where Sing Bingo really excels compared to the competition is in the free bingo games department. All new players will unlock access to the free Bingo Academy which features £1 cash prizes regardless of whether you make a deposit or not. Part of their free offering is the ‘I Want To Break Free’ promotion, which provides all funded players with a free £10 game every hour. 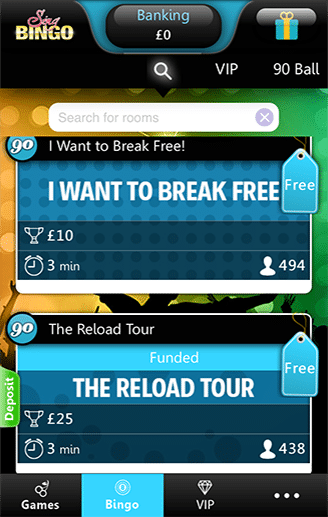 There’s also the Reload Tour free game which is open once per hour and dishes out up to £500 every day. This room is only available to players who have funded their account that day, giving you a decent chance of walking away with a tidy profit. In the penny games department, they have loads of £50 jackpot games, with at least 6 games throughout the day. Likewise, in the jackpots department, you will find guaranteed games with prizes of up to £3000 available. The best of which is the ‘Melody Maker’, which features five £1000 prize pots every Friday evening, plus tickets are free for those who have funded their account in the previous 6 days. The site also has a VIP program that entitles you to extra bonuses and promotions, plus depending on your VIP level, you will get access to games with prizes ranging from £25 to £500 for free. So if you want to get some massive freebie value, make sure you up your deposits and play more. Finally, because the site uses industry-leading Dragonfish software, you will find a superb selection of slots games. You may be familiar with a number of the titles already, some include, Monopoly, Cleopatra, Bejeweled, Fluffy Favourites and more. Welcome Offer valid until further notice for 18+ non-funded players only. Minimum deposit £10. Maximum amount of tickets is fixed at 120. Tickets will be awarded to 4 specified rooms only, 30 tickets per room. Max 6 tickets per game. Winnings in real cash. Deposit balance is available for withdrawal at any time. General withdrawal restrictions & full T&Cs apply. T&Cs are subject to change at any time. Please see the official website to confirm valid terms and conditions. 18+ Only. Please Gamble Responsibly. 18+ New Players Only. T&C’s + Wagering Apply! Having played at over 100 different Cassava and Dragonfish sites, Sing Bingo is up there with the best of them. Many such sites don't offer much unique value when it comes to bonuses and promotions, that, however, is clearly not the case at Sing Bingo. The site not only looks fabulous, it works great on a wide range of mobile devices and offers some incredibly rewarding promotions. No site would be complete without some massive jackpots and free games to boot, Sing Bingo delivers on both accounts and leaves me with no choice but to give them a glowing review and my wholehearted endorsement. Feel free to register through the link below, get started with some no deposit bingo games and then claim your 120 free bingo tickets bonus when you play on your mobile. * 18+ New Players only. T&C’s + wagering apply to all offers. Visit official websites for full T&C. Play for fun only – BeGambleAware.org.